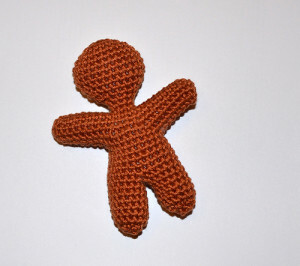 today I share the classic gingerbread man. mine are un-decorated, I wanted mine to be simple and plain, but of course you can decorate yours to your taste, I always see the little gingerbread man from Shrek whenever I think about gingerbread men. in case you have little holes between the legs, sew them closed with the yarn ends from the feet. now embellish if you wish and enjoy!